Carbon Sense Coalition – on the “climate change” fight from Down Under	TS Radio with guest Ty Bollinger…..How ’bout some BT contamination in your food? The Nature Conservancy (TNC), is also a member of IUCN and participates in and promotes many UN programs, which ALL promote Agenda 21. TNC is a “non-profit” that pulled in over $925 million in just one year (2010 tax form). Their contractors include Tetra Tech, the huge environmental company that prepares Resource Management Plans and Environmental Assessments for the Bureau of Land Management (BLM). The public is led to believe that The Nature Conservancy buys land with private money and sets up nature reserves to help the environment. “The Nature Conservancy frequently uses phony front companies to get land” and it purchased “most of the islands off the coast of Virginia, containing 40,000 acres and sixty miles of coastline. In doing so, The Nature Conservancy was able to stop all private development and control the use of the land, damaging the tax base, killing thousands of jobs, and severely curbing the locals from hunting, fishing, camping and joy riding on the islands. The International City/County Management Association (ICMA) partners with and works “in concert” with ICLEI. It is also called Local Governments for Sustainability and was established at the U.N. It’s an international association of local governments pushing U.N.’s Agenda 21 (also called Local 21) into many U.S. local governments. ICLEI will put more power and control in the hands of regional, non-elected boards. (Not city, county or state government, where you have a voice and a vote.) This is based on Regionalism. The Dept. of Energy, along with the EPA and State Department, actually FUND ICLEI USA with your tax dollars. The Forest Service also seems to be marching in lockstep to support ICLEI USA. Was the deck stacked in Reno? At the Reno meeting, Hugh Sanburg of the Colorado Farm Bureau commended Sec. Salazar for his appointment of Callie Hendrickson, and stated that Colorado Farm Bureau supported her. Is the Colorado Farm Bureau going to support IUCN, ICLEI and Agenda 21? John Falen of the Public Lands Council was also at the Reno meeting. This Council claims to “promote the great American tradition of freedom,” but yet John Falen (along with Callie Hendrickson) participates in pro horse slaughter Summit of the Horse events, organized by United Horsemen and International Equine Business Association, which are “partnering” with RFID companies that are “partnering” with international RFID companies that comply with international law. Everell Hayes, a longtime BLM employee, was representing the Public Lands Foundation at the Reno meeting. The Public Land Foundation’s members include past and present employees of the Bureau of Land Management, and its President is Henri Bisson, who was the BLM’s Deputy Director of Operations. NACD (National Association of Conservation Districts) encourages their state associations to sign Memorandums of Understanding (MOUs) with the BLM, and even has a sample on their website. They agree to promote mutual interests. It seemed like a stacked deck at this meeting for not only an agenda to remove and slaughter wild horses, but to deal in Agenda 21. Callie Hendrickson gave a presentation on wild horses before the tour, using BLM’s “fuzzy math” estimates (“guess-timates”) about the number of wild horses on the range. Hendrickson’s presentation also included a photo marked www.wildhorseroundups.com (the website for Cattoor Livestock Roundup, Inc.), a photo with S. Cattoor on it, as well as old photos from 1996, 1997, and 2002. It doesn’t seem like Hendrickson’s presentation informed people about other “uses” in the areas of the photos (either on those old dates or presently) that use a lot of water from aquifers and drop the water table. Her presentation didn’t seem to include the water drawdown maps from any projects (other “uses”) near the places where those photos were taken. The other uses of water effect water (and forage) not only for wild horses, but for livestock and wildlife. Prior to her BLM Wild Horse & Burro Advisory Board appointment, Hendrickson pushed for “sale without limitation” of older wild horses and wild horses not adopted after 3 attempts (most go to slaughter). At the Wild Horse & Burro Advisory Board meeting, there was talk of the merging of plans between the BLM & USDA’s Forest Service with “paired decision records and implementation” and cooperating agency agreements. There was the irony that while the BLM claims concern about rangeland health and drought, it would suddenly change procedure, “extending the shelf life” of Environmental Assessments (EAs), to only prepare one every 10 years instead of the usual 1-4 years. This not only gives the BLM a blank check to roundup as many wild horses as they want in that 10 year period, it also gives the BLM even less accountability to the public. The wild horses are the canary in the coal mine. As the wild horses are being removed from your sight, it is also the end of the trail for your private property rights, Constitutional rights, your voice in government, and real cowboys – what you are seeing in their stead is the implementation of Agenda 21 and international law. Is your city a member of ICLEI? What is behind the push for horse slaughter? “Is the United Nations Stealing Control of our Water (and Republic) Right Out From Under Us? The new chairman of the U.S. Bureau of Land Management’s Wild Horse and Burro Advisory Board has seen a lot in his 35 years as a veterinarian in rural northeast Nevada. But he admits, he’s not sure what he’s gotten himself into this time. 4-14-2012 The sacred politically appointed anti-wild horse-burro BLM Advisory Board is back in Reno to continue their annihilation of America’s wild horse-burros from their legal ranges. The bottom line is that BLM, controlled by corporate ranchers, now pro-horse slaughter thugs, big game wildlife hunters, i.e. Guzzler-Larry Johnson…a politically powerful Eurasia big horn sheep proponent, are zeroing out the few remaining HA, now called HMAs, which represents BLM’s calculated shrunken original HA (herd area) ranges designated by federal law, using drought, or other manufactured rhetoric, to gain support of the ignorant gullible public. HA 308 Horse Springs (mid 1980’s) in the Virginia Range was/is an example of their attack. 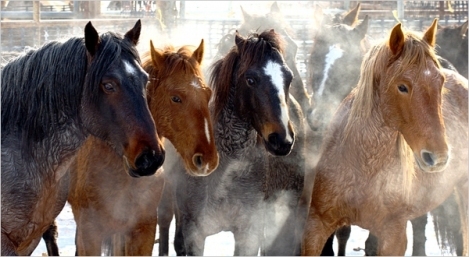 In Nevada, when a HA/HMA is zeroed out, the remaining wild horses-burros come under the jurisdiction (management, i.e. attack and destroy) of a rogue NvDOA, thanks to our NV legislature/self-serving politicians, where they are then labeled, estray or feral, that allows the corporate welfare ranchers and their associates to capture them and off to auction/slaughter they go with the blessing of the NvDOA brand inspectors, etc. As Nancy Whitaker accurately called it some years ago in one of her revealing/enlightening articles, an Eradication Program. Hendrickson joins James Stephenson of south-central Washington, a consultant for the Yakama Nation who, in June of 2011, was appointed by Secretary Salazar to represent Natural Resource Management on the Board. At the October Board Meeting, Stephenson spoke in favor of horse slaughter for the Yakama Indian Tribe and for wild horses removed from their homes on public range lands in the West by the BLM. Sutherland refers to the minutes of secret meetings held by BLM officials in 2008. Minutes of these meetings came to light in 2009 when Dr. Pat Haight, President of the Conquistador Equine Rescue and Advocacy Program, filed a Freedom of Information Act (FOIA) to acquire the documents. BLM officials talked of ways to avoid NEPA (National Environmental Policy Act) compliance, clean water standards, and Congressional oversight. The need for psychological counseling for employees ordered to kill healthy wild horses was raised as well. When asked about these meetings, BLM denied any plan to destroy wild horses in holding. The problem IS with the agencies, per se – they have bypassed Congress and are implementing international laws with their “policies” and plans. There are a BLM employees I talk with and like personally, but the agency and it’s directives that are the problem. And Congress is a problem for knowing all of this and allowing it to happen. People should vote out the incumbants and vote for anyone talking about the Constitution. Wow, Debbie Coffey. Great research. I keep running into the themes of “sustainability” and the idea that we should feed the world with our resources. I can see that this would give people who manage public lands incredible power creating little kingdoms or fiefdoms of power. I haven’t understood exactly where the conservation districts fit into this, but I have recognized a pattern in some of the research that I’ve run across. You are making sense of this so that the rest of us can understand these as cohesive forces. Thanks. And … while we are on the subject of government agencies killing “behind closed doors”! Read this! BEWARE OF THE WOLF IN SHEEP’S CLOTHING – BLM WH&B ADVISORY BOARD PULLING THE WOOL OVER THE PUBLIC’S EYES? I listened to most of the two days of the WH&B advisory board meeting and heard over and over that they are planning for wide-spread “emergency” round-ups of the wild horses and burros right away because of the drought conditions that have supposedly caused widespread forage and water issues on the HMAs. Basically these “emergency” roundups are just a front/excuse to round up as many WH&B as they want, when they want without public input or even notification (this is historically documented). These supposed emergency drought roundups were a MAJOR topic at the meeting. So… I thought I would research for myself the historical precipitation data of the mid-Nevada area and picked Winnemucca since that area is near the center of the state and near the upcoming proposed Jackson Mt. HMA wild horse capture. Here is what I found on the National Weather Service (NOAA) website. 2012 current precipitation is 75% of “average” (normal). In order for anything to be considered normal or average there must be ups and downs and 75% of normal with two more months of precipitation ahead of us (see NOAA) is not a drought. If there are any forage or water shortages on the HMAs it is because these resources have been sold right out from under the noses of the legally designated Wild Horses and Burros (and you and me) by guess who … the BLM. Same here Grandma..just when i think I have these snakes all in one pit, another pit opens up. I get sick at the site of so-called Americans helping to implement things that will hurt other Americans. This isn’t even a case of “I was jsut following orders”……this is “I helped make up the orders and took as much as I could for myself”. Benedict Arnolds every cowboy hat wearing one of them! As always when I read Ms. Coffey’s articles, I find that I have a LOT to learn but that the spider web of the BLM and its “associates” is a very sticky one and I know from personal experience that they lie to the public and then cover it up. Kinda’ like a cat burying its poo – but the poo is still there! Why does no one mention the Land Patent as a barrier to A21? From what I read it’s absolutely bulletproof when it comes to retaining all your rights to your property. Here’s one place you can get help with filing the paperwork, but a search on the internet will allow you to do your own legwork. The reason all these people are getting hassled and driven off their land is that they’ve entered into a contract with the government in which the people are inferior parties when it comes to the property in question, in the same way that you pay full price for a car, then REGISTER it instead of RECORDING the purchase, and with that action, convert it to public property – that’s why they can confiscate it if you don’t register it annually, though they usually don’t go that far, since they don’t want to anger people enough to research the scam, so they’ll just bleed them with fines. Beware of any contract you enter into with the gov. Someone would be well advised to start paying some attention to this lady. These Rockefellor, Rothschild, Bush, Clinton, Gore,Kerry, Romney/Obama Light: U.N. Globalist, Elitist, Totalitarian Despots; will NOT rest, untill they CONtrol the World!